Don’t you think that everybody should have access to healthy, nutritious food? That’s why we are asking you to help us shine a light on this important issue by hosting a morning or afternoon tea in your workplace as part of 2017 Anti-Poverty Week. Use the 2017 Anti-Poverty Week ‘Uncovering Hidden Poverty’ event kit to bring your friends, family or colleagues together for a morning or afternoon tea, and start a conversation on how we can all work together to create a more equitable and prosperous community for all. 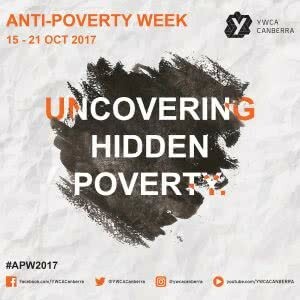 Anti-Poverty Week is a chance for the community to highlight issues of poverty and inequality, and to come together to seek meaningful solutions to addressing these challenges. 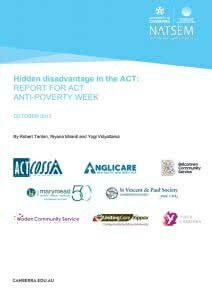 This report shows that disadvantage exists in the ACT, but that it is often hidden by high overall averages on indicators as income and education. Disadvantage is also hidden due to its distribution across the ACT rather than it being concentrated in particular suburbs or regions. The diversity of Canberra is one of our city’s strengths, but it requires careful attention so people experiencing disadvantage don’t drop off the radar by not being statistically visible at the suburb, regional, or Territory level. This report is based on findings from research undertaken by NATSEM at the University of Canberra commissioned by ACTCOSS in partnership with with Anglicare NSW South, NSW West & ACT; Belconnen Community Service, Marymead, St Vincent de Paul Society – Canberra/Goulburn, UnitingCare Kippax, Woden Community Service and YWCA Canberra.